This entry was posted in Uncategorized and tagged Advent, Anglican, Bible, Disciple, Annunciation, Christianity, Creation, Episcopalian, Jesus, Mary, Spirituality, Theotokos. Bookmark the permalink. Thank you for connecting Mary’s story with a personal and present day context. We are in concord here, I think, in that the bible and stories within it are a dynamic and recreating creation story that is always now, here, at this time, for us, today. I have never thought of Mary’s Conception of Jesus as being something I could take on board for my own daily living. i shall now, gratefully and prayerfully consider the options! Beautifully written, James. Mary’s response to God spoke deeply to me (and still does) during my discernment. God’s word is ever present and active. Thank you. Thanks so much. I think you’re precisely right: the process of discernment must be the process of our response to the Word, which always locates itself within the present tense. Can we bear the Christ child…can we bring him into the world? These words resonate deeply within me, reminding me of the larger purpose of all I mean to do. Thank you. I’m so glad you liked the piece. In a very real sense, the evangelical impulse (bringing Christ into the world) begins with Mary. It’s my hope and prayer we continue that work. 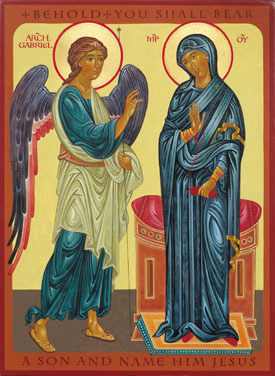 When you mentioned how startling it is that the angel visited Mary, it brought to mind an old cliché: that if we were ever visited by extra-terrestrials, they would greet us with the words, “Take me to your leader.” Gabriel bypassed the leaders of both Jerusalem and Rome. If he were to do that today, I don’t suppose it would play well over at the Department of Homeland Security. This story really is startling, as you say. But what’s even more startling is that it wasn’t just a private religious experience. The “impossible” was transacted in that moment, and the result was world-altering. Your post reminds us that God is still here… and still willing the impossible. Thank you for challenging us to make God’s will our prayer. I think the message “Emmanuel”, that God is really with us, really for us, is always startling. Thanks for your thoughts. Great message. I love the idea of advent as a metaphor for our response. I believe it is also a reminder that one day Jesus will return. Will he find his church ready – particularly in the West. Thanks again. What I especially like about the first two chapters of Luke is all the coming and going, up and down, over the hills, into Galilee, Jerusalem, Bethlehem. The Temple, Mary’s home, Elizabeth’s home. God stirring and mixing things up. I want to comment her on the iconographic tradition of basically never portraying Mary with out her Son. All her glory is from her relation to him; being Theotokos i more important than being Mary. I was thinking yesterday that while we do portray Christ independently of her in iconography, in life we don’t; or rather, we cannot. Christ had to be born in context and he must be bourne in context. When Christ is preached, the preacher is part of the picture. The Church’s presence effects the Christ the world sees and hears. Jesus does not enter life as a “deus ex machina” now any more than he did through Mary. He is implanted, incubated and brought forth by a faithful, humble Church. He cannot be shown without the Mother. The writers of icons have a good deal to teach us about Marian devotion. The other part of this notion is of course, just as Mary is the “context” for Christ’s original entry into the world. We must be the context now.